The philosophy of the Environmental Management MSc programmes centres on the need for new environmental professionals: people with a strong cross-disciplinary understanding of the societal, economic, and environmental challenges posed by the emerging sustainable environmental management agenda. The course aims to provide you with the in-depth knowledge and the essential practical and evaluative skills needed to give leadership for low carbon, resource efficient, sustainable futures in diverse global contexts. Environmental Management MSc – this core pathway explores the rationale behind the exploitation of natural environments. It provides you with detailed knowledge and understanding of the important relationships between sustainable environmental management and natural ecosystems and the value of adopting an integrated approach to studying both. Environmental Management (Energy) MSc – this pathway is timely, nationally and internationally relevant, given the world's energy needs, as well as the surrounding political debates regarding fossil fuels and increasingly, renewables, which form such an essential component of the world's existence. With established and active links with European and American universities, the course ensures a globally relevant curriculum and produces graduates who are able to innovate and respond to new and emerging challenges within environmental management. The programme will provide you with a good basis for careers in local government, NGOs, major international companies, independent consultants, and in education (eg. research and enterprise). Transferable skills in geographical information system (GIS), experimental design and data analysis. Please note: fieldwork will incur an additional financial cost. Details regarding fees for field trips are specified in relevant module guides or ask the course director. The Institute of Environmental Management and Assessment (IEMA) is the worldwide alliance of environment and sustainability professionals, working to future-proof business and organisations. 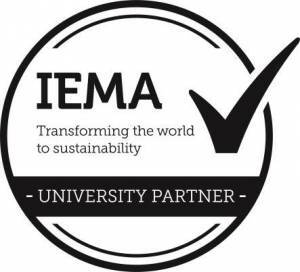 The Environmental Management MSc course at Kingston University is an approved IEMA partner. This means that students who successfully complete the Environmental Management MSc course automatically qualify for GradIEMA professional status and can also fast track to PIEMA (Practitioner Status) with completion of a work-based competence assessment. Graduate membership is a launchpad for future leaders within environment and sustainability and offers a range of benefits to support you throughout your career. Students enrolled on our course will receive free student membership (normally £25) giving them access to a wealth of knowledge and resources to support their studies and future career path. You will study the theoretical, practical and legal frameworks promoting sustainable environmental management and other drivers for sustainable behaviour at individual, institutional and governmental scales. You will learn how to innovate, respond to new and emerging challenges and work effectively in changing and unfamiliar situations. The programme is made up of four modules each worth 30 credits and a research project module worth 60 credits. You will have the option of choosing from modules which explore aspects of sustainable environmental management, such as water, energy and land resources management and climate change. Written exams, seen exams, practical exams, essays and research articles. This module explores the motivations for, and paradigms of, 'sustainable development' at scales ranging from local to global including its grounding in economics, the social environment, in environmental politics and policy making as underpinned by law. This module examines the relationship between water, energy and land (including the WEL-nexus), associated environmental management challenges and sustainable management solutions. The module will develop an understanding and critical evaluation of these challenges at a variety of scales through the systematic investigation of the component challenges (water, energy and land), the interface between the components and their relationship to sustainable development. This module provides basic skills in research methods and techniques, including geographical information system (GIS) for data storage, manipulation and display. It initially develops GIS skills by introducing GIS concepts, sources for geographical information and outlines basic spatial concepts. Subsequently the module encompasses the theoretical underpinnings to research methods and techniques, including sampling schemes, measurements, quality control issues, and data collection, manipulation and analysis. This together with practical elements of designing research proposals and data testing enables the necessary skills for carrying out independent research work. Evaluate the use of GIS in the capture, storage and handling, manipulation and analysis of geographical information. Critically discuss what a GIS is and develop an understanding of its relevance to key application areas. Apply the latest developments in geographical database technology to geographical database case studies. Synthesise the literature on a specific topic and identify key researchable issues relating to the literature review. With respect to one researchable issue, develop aims and objectives and relevant research methodologies for a specific research project to enable them to meet their aims and objectives. Manipulate data using a computer and select, execute and interpret results of appropriate data analytical methods. This module reviews current ideas on climate change and its implications for society. The complexities of this debate and their relevance to a sustainable future for human societies, and to ecosystems and planetary well being, more generally, are explored. Keynote lectures will introduce the science of climate change; uncertainties and challenges in global climate change modelling; implications of climate change predictions; appropriate societal responses; and 'best' strategies for mitigating potential climate change and its impacts. The challenges of policy-making against a background of uncertain science are explored through case studies and role-play scenarios and by site visits. This final module provides students with the opportunity to design and execute an original research ‘capstone' project related to their own discipline specific interests, which synthesises their learning. They will develop a theoretically informed body of work that integrates both theory and practice. It may take the form of a dissertation, practice project, or experiment-based project. Following submission students present their findings at a Masters Students Conference. Critically evaluates current ideas in the field of energy (eg production, conservation, economic value and the "energy trilemma"), relating to conventional and non-conventional hydrocarbons; nuclear power; and other alternatives such as wind, wave, geothermal and tidal.